It's hard to believe the amazing and creative things RV and camper owners have done with their rolling residences. Renovating and decorating these vehicles has become an art for a design discipline all its own, and you just never know what you will find when you venture inside. Although the models and layouts may be similar, every camper is clearly a representation of the people who love it. Sometimes it's hard to imagine what they'll think of next after you encounter a new and innovative use of these tiny spaces. These RVs, trailers, pop-ups and converted school buses can be found all over the country. Top 50 U.S. and Canadian RV dealer @Affinity_RV of Arizona compiled a collection of photos to show what wonderful things great minds can do when presented with a small space on wheels, an eye for design and an adventurous spirit. Read on to see some exciting camper renovations. This luxurious passenger seat is a beautiful place for a copilot to lounge alone or with friends. There's plenty of legroom, a place to put feet up and welcoming pillows and blankets, too. Although there aren't any seatbelts shown, the family planned to install several so everyone could enjoy the view outside of the giant windows while staying safe and secure. Okay anyone else feeling like Co-Captain is the much better option!🤣 With this as the passenger's seat I would never drive again! Whose with me!?!? 🙋🙋 ♂️ Seriously though, how does @wilsonfamily.adventures choose who drives! Follow @affinity_rv for more! Some campers love to travel with their dogs, but finding a safe place to keep them at night or while the rest of the family is out exploring can be challenging. Check out this combination dog crate and TV stand that solves that common problem. There is plenty of room for dogs to stand up or stretch out and rest while staying contained. One thing many full-time RVers miss is a good bath, so why not install a bathtub? This tub would not fit inside of most camper bathrooms, so these owners installed it in the living room. The curtain offers some privacy, and the hand sprayer will help the bather to reach difficult places. A hole is likely in the bottom of the floor to facilitate drainage. The pressed tin panels in the back and above add some class. What a sweet little cubby for baby's bed! This setup is genius. Mom and Dad get their own space, but the baby gets a tiny private area too. Best of all, this crib is only inches away from the parents, with only a wall dividing the family. No baby monitor needed! Do you see the hidden baby? . Love how @thewolfbus utilized this space to accommodate traveling with a young one! Anyone here Travel with their Kiddos? . Follow @affinity_rv for more! Who said pop-up campers can't be beautiful? This sanctuary is so inviting and clearly loved deeply by its interior decorator and owner. The color combinations are clean and fresh, and the couches and bed nearly command that you climb in with a good book on a rainy day. Add in the golden lamp, the little footrest and the woven floor mat, and this camper is more luxurious than some actual homes. We are relaxed just looking at this Reno! Who's with us? @zevyjoy did such an incredible job and make this space so inviting! Follow @affinity_rv for more! What about school buses? The conversions and renovations of these often overlooked, forgotten and neglected vehicles can be mind-blowing. Buses offer wide spaces and are usually open once the old seats are removed. The floor really ties the space together, and the rocking chair and wood stove are cozy touches. Here's another converted school bus interior not to be missed. First of all, the wood on the ceiling, floor and in between gives this interior an outdoor feel. Besides that, though, just look at that kitchen. The galley is quite large for a home on wheels. It features a full-sized sink and a full sized, four-burner stove. These owners must really love to cook. What's your first thought when you see someone with a 4 burner stove? ...... JEALOUSY.... don't worry us too! 🤣🤣🤣 Be prepared it will get worse with each swipe @navigationnowhere slayed this design! !😬😬 Follow @affinity_rv for more! Don't forget the outside: A complete camper renovation includes the exterior as well as the interior. This trailer went from drab to fab with a few coats of blue paint. The before picture looks very dated and worn out, whereas the after picture looks like a brand-new trailer. Scroll through this Instagram post to see the exterior of the trailer. Some people take it even further and paint the camper's exterior in an exciting way, like these owners did. There is so much to look at. This eye-catching landscape includes dinosaurs, Route 66, cacti and hot air balloons. 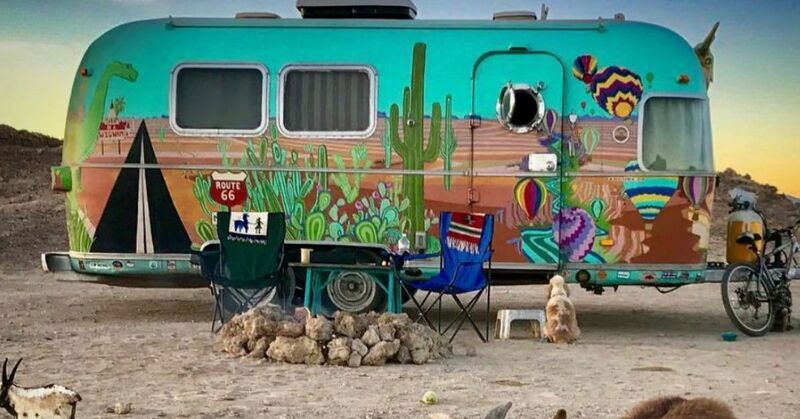 If you are artistically inclined, you may want to add some special flair to the outside of your camper too or find a mural artist to create something special. This deck nearly doubles the space offered by this already beautiful and quite large Airstream trailer. This photo serves as a reminder that a camper renovation can actually stretch beyond the structure. This deck offers shade, seating, mattresses for lounging and a beautiful view. There is no better way to enjoy a sunset than on a deck, surrounded by nature and beauty. Would you stay here? 😍😍😍 Let us know below! We love this @airbnb! We would totally stay here! . . . Follow @affinity_rv for more!